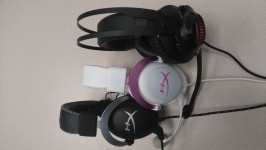 The below left image shows the HyperX CloudX headset alongside the Cloud and the Cloud Revolver headsets. Physically the Cloud and CloudX sets are identical in size and style. From that picture, and the one on the right, you can see that the Revolvers are much more substantial. As an adult with a large head, I can say that the CloudX and Cloud headsets are more than big enough to fit my head, so they may look small next to the Revolvers, but they are definitely well sized. While covering the physical features of the HyperX CloudX headset I have already covered a handful of highs and lows while in use, but we'll cover a few more points in this section. I do not have an XBOX controller with an audio jack, so these were not tested in that manner. I did however use them with my PC for some audio and gaming, as well as with my mobile phone. On the PC, the audio was definitely very nice. I used the breakout cable to have the headset plug in to my dedicated audio and microphone jacks on the back of the PC. While listening to music or watching movies, the sound was full and warm, with crisp highs and fairly realistic bass. The earcups do a great job of blocking out external noises, as I was able to focus on my entertainment, even with other people in the room doing whatever else they wanted to do. While gaming, things were a bit different... 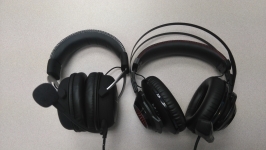 Many headsets lately have been all about surround sound (or at least simulated surround sound), and the CloudX headset seems to be more about immersing you in 2-channel stereo sound. While you may not have the 5.1 surround effect with this headset, the in game audio is very realistic, and I wouldn't say I feel that I am missing out on anything. Most of the testing occurred while connected to my mobile phone. I hooked these up a few times, and have logged several multiple hour sessions without getting fatigued from them. In the past, I'll have to turn off the music before I am ready, simply because either my head or ears are bothering me and I need a break. Not with the CloudX headset! As mentioned earlier, I used them for several hours of yard work this past weekend, and never had a problem with the comfort level. Even with a leaf blower or lawn mower roaring too, I could hear my music very clearly, and was very appreciative to how muffled those engines became.